I wonder how many of these she really sold. Click on the image to read the text in a larger font. I love to wear dresses in the summer. Dresses are just so comfortable, and just like Helen Mirren, I've never really understood why shorts are such a staple. Dresses are so much more flattering to most people. I love this style dress -- empire waist means no cutting in at the waist, and the full skirt gives lots of room for movement. Two pockets gives lots of room for carrying keys, gardening gloves, or what have you. I'd make the neckline a bit lower, just because the neckline shown would be kind of binding for me, but that's about the only change I'd make. Besides making it in a different fabric for every day of the week. Where have all the blouses gone? 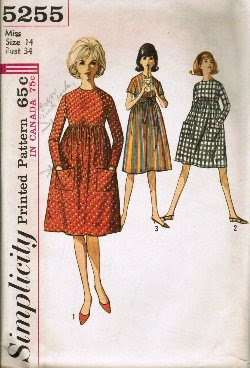 A few years ago, I had a customer who told me that she looked for blouse patterns from the 50s and 60s. She mentioned that that was an era where they made simple but pretty blouses, and that today's patterns tend to be too complicated, with details that she didn't want or need. 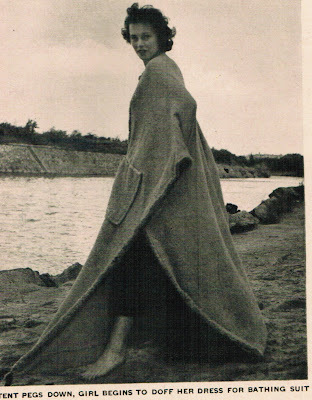 Think Jacqueline Kennedy. 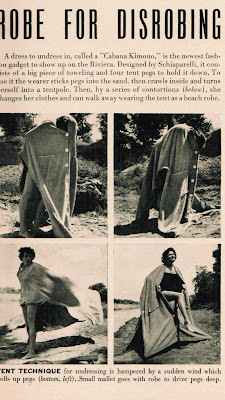 Her style was simple chic: clean lines without a lot of frou frou. She didn't tend to dress in ruffles or anything that would overpower her, and the simple styles she preferred were perfect for accessorizing in different ways. 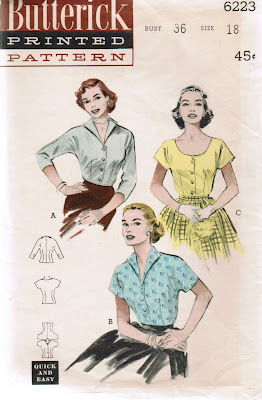 This little blouse pattern (from 1952) is a good example of what I'm talking about: simple lines that will work with jeans, skirts, or dressier trousers. The little wing collar is a nice little touch, while still keeping it simple. And the three quarter sleeves? A great option for those of us who don't like baring our arms. So when it comes to blouses, keep it simple! Click on the image to shop, or check out the 50s and 60s categories for lots of other cute styles.